You can have easy, total control of your fire in the palm of your hand with the Real Fyre Deluxe On/Off Remote Control. This deluxe variable receiver/transmitter set offers total thermostatic control for select Peterson automatic pilot kit models. Controlling the temperature of your fireplace has never been easier. Keep it warm and simple with this deluxe remote from Real Fyre. 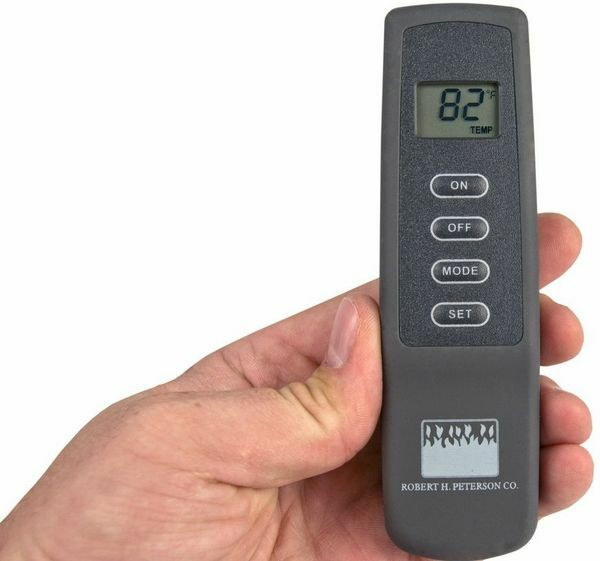 Will this Real Fyre Deluxe On/Off remote control allow a preset temperature for the logs to come on as well as turn off? Will this also work during a power outage? A remote system like the one in question will heat the room to a pre-set temperature and is accurate to within 1-2 degrees. If you were to set the temperature to 72 degrees, a compatible log set will heat the room until the transmitter senses the temperature has reached 72 degrees. Once the preset temperature is reached, the system will shut down. This remote system, as well as all remote systems for gas log sets, will be battery powered and will provide functionality in the event of a power outage. How do I convert it from Celsius to Fahrenheit? In order to switch between Celsius and Fahrenheit, hold the "On" and "Off" keys on the transmitter at the same time. After 1-2 seconds, the temperature readout should switch.